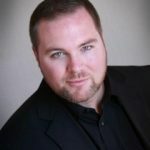 Acclaimed as a “lovely, tender high tenor” by the New York Times, Owen McIntosh has enjoyed a diverse career of chamber music and solo performance ranging from bluegrass to reggae, heavy metal to art song, and opera to oratorio. A native of remote Northern California, Mr. McIntosh has shared the stage with the country’s finest ensembles including Apollo’s Fire, Blue Heron, Boston Baroque, Carmel Bach Festival, Les Canards Chantants, Les Délices, New Vintage Baroque, San Diego Bach Collegium, Staunton Music Festival, TENET, Trident Ensemble, True Concord, and the GRAMMY® nominated Choir of Trinity Wall Street. Recent solo engagements include; Bach’s St. John Passion with Tenet, Mozart’s Die Zauberflöte with Boston Baroque, Haydn’s Chamber opera L’isola Disabitata with the American Classical Orchestra, the Monteverdi Vespers of 1610 with Apollo’s Fire and Green Mountain Project, Bach’s’ St. Matthew passion with Grand Rapids Symphony, il Ritorno d’Ulisse in Patria with Opera Omnia and Boston Baroque, and evangelist in Bach’s St. John passion with True Concord Voices and Orchestra.